Written by Chris Humphrey. Top photo by Chris Humphrey. 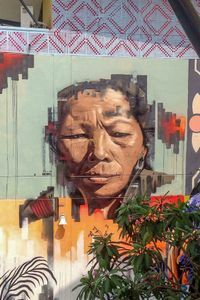 Street art in the Vietnamese capital remains a nascent scene, yet it is growing swiftly, with both Vietnamese and foreign artists in the mix. For local artist Zunk, to paint is to be part of a community. “It’s been amazing for me. At this time, the scene is really active. Matthew 'Phed,' who passed away four years ago, had a big impact. We’ve been making a memorial wall for him together every year since then,” Zunk shares. Some focus on tagging, or “bombing,” while others specialize in murals or artwork that deliberately attempts to benefit the community. “I have contact with one artist who paints electricity boxes on the pavement" Zunk adds. This artist works with authorities and gets approval for specific designs, and so "people take it easier than graffiti." This leads on, however, to an unavoidable issue. Thanks to its often unsanctioned nature, the genre is divisive across the world. Hanoi is no exception. 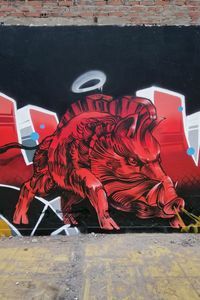 Recent tagging on Nghi Tam Street drew attention from local media and sparked debate about what form street art or graffiti should take and where it should be created. "If they spray on the fences near where people usually put trash, at least it might make it more beautiful," one local resident on Au Co Street said, according to VnExpress. Others were unhappy about tagging on rolling shutters or the concrete wall on Nghi Tam, which is awaiting a new mural following the leveling of the road. Artwork and photo by Mate. For UK artist Mate, this tagging was never meant to offend. “All the artists who painted there knew the mosaic wall would replace it, which we all want. We love the mosaic wall and all other public works of art,” he says. Those involved in the street art community are aware that not everyone appreciates tags appearing on the street. For many years, the focus in the capital has been on creating larger murals or art with a positive community message, although tagging is becoming more common. Whatever your perspective, the scene in Hanoi has grown significantly over the last decade and is becoming more visible. In this article, we’re focusing not so much on tagging, but mainly on the murals and larger-scale art that’s also increasingly adorning city walls. Artwork by Mudrok. Photo by Kevin Lee. Artwork by Sautel Cago. Photo by Kevin Lee. Part of a mural remembering Mathew 'Phed', who passed away four years ago. Photo by Chris Humphrey. Artwork by Nasty. Photo courtesy of Mate. Artwork by Rhok. Photo courtesy of Mate. Artwork by Mudrok. Photo by Chris Humphrey. Artwork by Soor. Photo courtesy of Hanoi Concrete Jam. Artwork by Mate. Photo by Kevin Lee. Artwork by Scott Matt. Photo by Chris Humphrey. A collaboration between Rhok and Mudrok. Photo courtesy of Hanoi Concrete Jam. Artwork by Mudork. Photo courtesy of Mate. The scene is intertwined with other urban culture like hip-hop dancing. Artwork by Mudrok. Photo courtesy of Mate.